Is the best cheesesteak in Reading Terminal Market not really a cheesesteak, or even a sandwich? It is if you ask me. Regular on the left, chicken cheesesteak on the right. 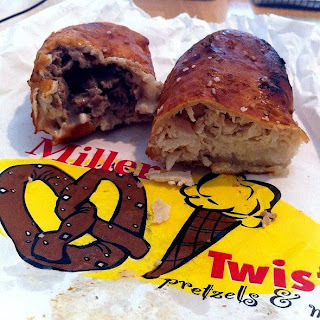 The cheesesteak-stuffed pretzel from Pennsylvania dutch vendor Miller’s Twist is one of my favorite bites in all of Reading Terminal Market and something you have to try at least once. The cheesesteak devil on my shoulder tells me to get one on every visit to RTM, even if I've already had another sandwich. Combing two of Philadelphia's most popular foods, the salted, buttery soft pretzel is pulled directly out of the oven and filled with a hearty serving of steak and cheese. Served all warm n' gooey, it is like heaven on earth. And at $4.50, it's a good deal, too. Miller's Twist also stuffs its homemade pretzels with chicken cheesesteak, sausage and broccoli rabe, ham and cheese, and hot dogs. In fact, did you know the Miller's Twist cheesesteak pretzel was nominated as one of the best sandwiches in the world by Chowzter? Quick story from Kristy to explain how it happened. Chowzter, as you may recall, is a new website/app to help you know what specific dishes to eat in a new city, as recommended by local food bloggers. When Chowzter’s founder Jeff Merrihue visited Philadelphia to talk with us about contributing, we shared a great meal over DiNic’s roast pork at Reading Terminal. Then he asked what else was good in RTM. Minutes later Jeff was literally stopped in his tracks mid-bite by the Miller’s Twist cheesesteak pretzel. He has raved about it all over the world since and helped it get in the running for Chowzter’s international awards, where an audience of international foodies got to learn about this hidden gem from Philadelphia. Alas, our hometown hero didn't win, but that shouldn't stop you from trying it on your next visit to Reading Terminal Market. For other RTM options check out our series on sandwiches at Reading Terminal Market. You have to try their breakfast pretzels--- I could eat one every day.